Einstein was very productive in 1905. He completed his theory of special relativity, and he published his papers on photo-electric effect and Brownian motions (proving Avogadro's number is a physical number). In 1921, Einstein received his Nobel prize for his work on the photo-electric effect. The problem was and still is why the Nobel Committee did not give credits to his formulation of special relativity leading to his E = mc 2. This question is still debated in the physics literature. 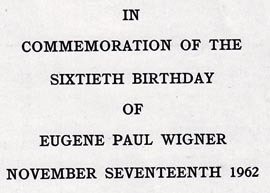 In 1963, Eugene Wigner was awarded the Nobel prize for his contribution to symmetry problems in physics. Here again, the Nobel Committee did not give any special credit to his contribution to special relativity, as in the case of Einstein. 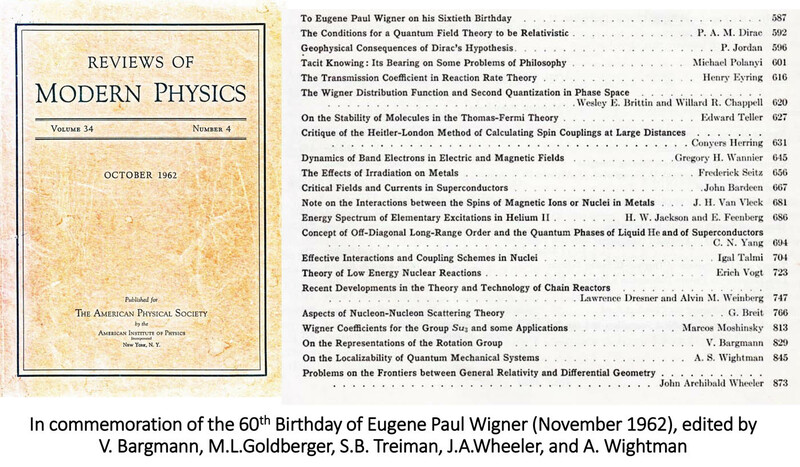 We do not know how the Committee's decision was made, but it is safe to assume that the committee members examined carefully the special issue of the Reviews of Modern Physics dedicated to Eugene Paul Wigner on his 60th Birthday. You may click here for this issue. If your computer cannot reach this journal, you may click here for the cover and contents pages of this issue. 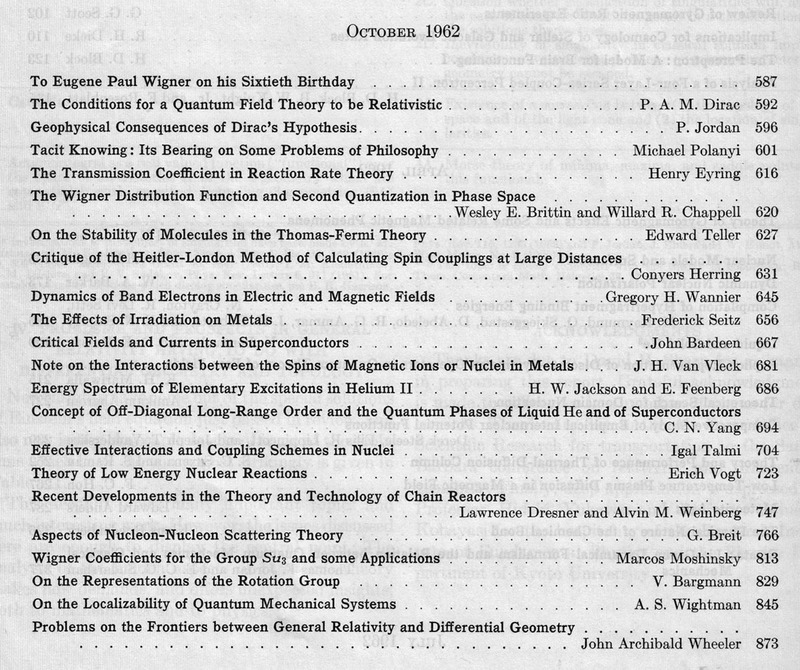 1939 paper on the inhomogeneous Lorentz group. Dirac mentioned this paper in general terms, but he did not discuss Wigner's little groups carrying specific physical interpretations. No other authors in this issue mentioned this paper. Thus, we cannot blame the Nobel Committee for not mentioning this paper as Wigner's major contribution. Wigner was happy to receive his Nobel prize, but not 100-percent happy because he did not receive the full credit for the paper dearest to his heart. internal pace-time symmetries in the Lorentz-covariant world. I presented to him the following table, which I published in J. Math. Phys. 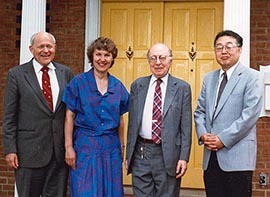 (1986), with my younger colleagues (D. Han and D. Son). The extended version of this table was published in Phys. Rev. Letter (1989). You may click here for a detailed exposition of this issue. There cannot be any disputes on one full Nobel for Einstein's row on the energy-momentum relation in the above table. Likewise, Wigner deserved one full Nobel for his row on the spin-helicity-gauge. This was exactly what Wigner wanted to hear. This table made some people very unhappy. Arthur Wightman sent me a letter telling this table is wrong. Louis Michel became very angry and wrote a letter to the president of my university to reduce my position. 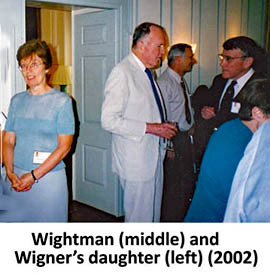 Who were Wightman and Michel? I must have been close to both Michel and Wightman because I took these photos with my cameras. They became quite upset when I approached Wigner directly without their clearance. Arthur Wightman was a professor of physics when I was a graduate student at Princeton (1958-61), and I learned the Lorentz group in his class. 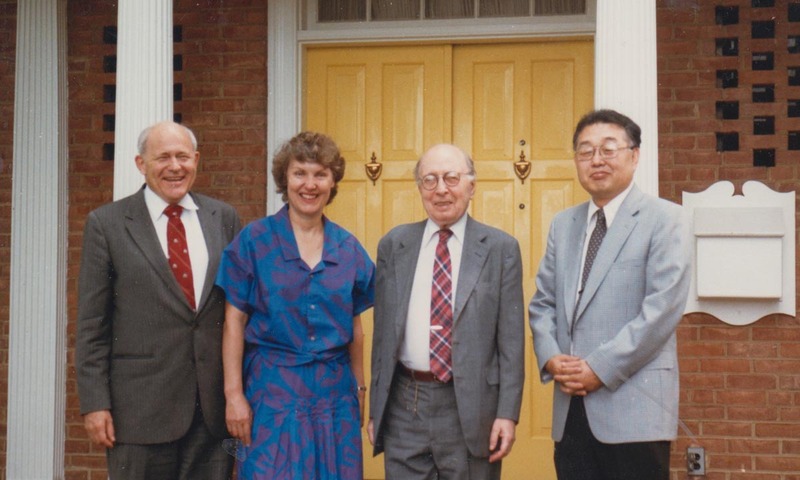 He took over the Jones professorship after Wigner formally retired from the University. He liked me and I still like him. However, he behaved like King Herod on this issue. Since he sent me a letter telling me the above table is wrong, he must have told Wigner the same story. Wigner and Wightman had their offices in the same building (Jadwin Hall at Princeton University). Louis Michel was the most respected French mathematical physicist, who also made a major contribution in neutrino physics, known as the Michel parameters. I also learned the Wigner stuff from Michel when he gave a series of lectures at the Univ. of Maryland. 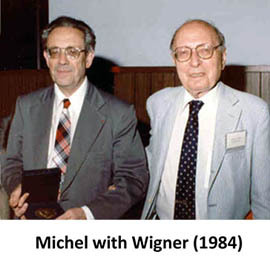 Wigner thanks both Michel and Wightman in the English version of his book entitled "Group Theory and Its Applications to the Quantum Mechanics of Atomic Spectra." Thus, they had enough reason to regard themselves as the guardians of the Wigner Castle and to get upset when I approached Wigner without their permission. They were OK. I still like them. They deserve their Herod complexes, and I also enjoy my own Herod complex. John S. Toll used become very happy when Wigner came to the Univ. of Maryland. This photo was taken in 1986 at the presidential mansion. There were some other characters who attempted to destroy my approach to Wigner, but they are not worth mentioning. In spite of all those noises, I enjoyed the full support from John S. Toll, who was the president of my university at that time. He used to become very happy whenever Wigner came to his campus at my invitation. Who was John S. Toll? He was John A. Wheeler's student at Princeton. 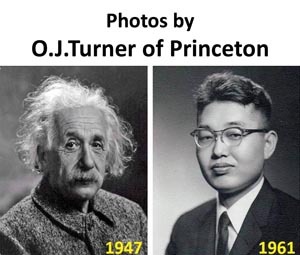 From Princeton in 1953, He came directly to the Univ. of Maryland to become the chairman of the physics department. He hired me as an assistant professor in 1962. I was a young man at that time looking like a graduate student. The best thing John Toll did for me was to assign me as a personal servant to Paul A. M. Dirac in 1962 when he visited Maryland for two weeks. Click here to see what I learned from Dirac at that time. 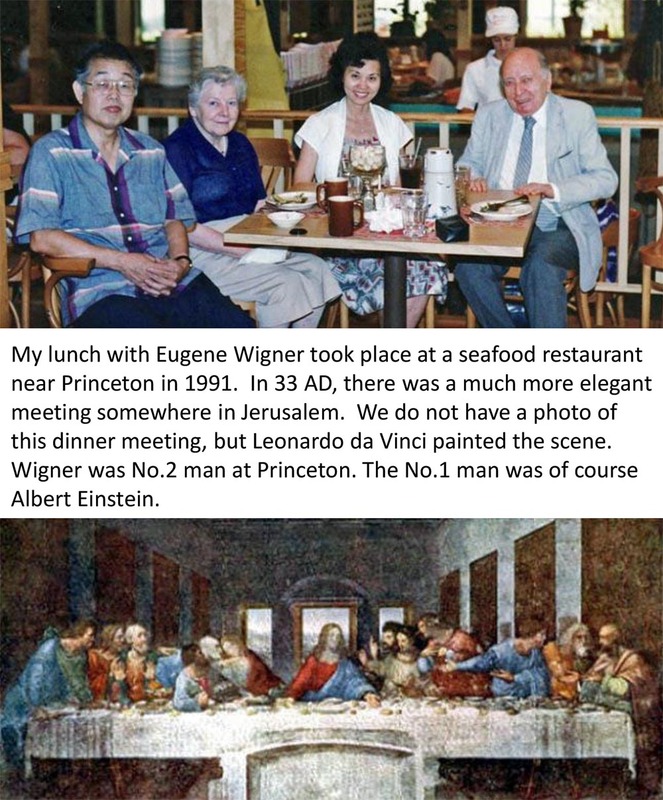 What comes after the Einstein table given above? Click here more stories. 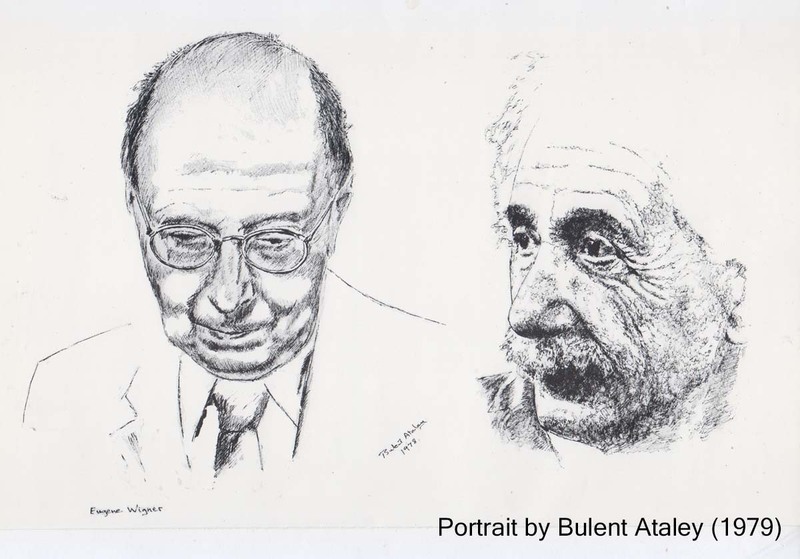 Why is he with Einstein?